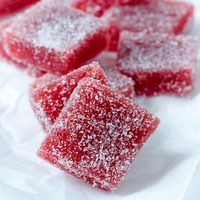 A rhubarb and berry flavored jelly candy. This isn't overly sweet, but it is a tasty example of rhubarb and berries complimenting each other while making use of CAP Jelly Candy's texturizing properties. really something different but not wtf am I vaping weird. I can easily vape this all day since, as concrete said, the rhubarb keeps it from being cloyingly sweet. Was really hard to find a nice light & fruity recipe that used rhubarb, everyone always says how hard it is to work with and yet, here, its seems philosaphucker has made light work out of it, making it seem so effortless to work with. I love it when mixers can do that with a flavor! Tested this after the recommended 3 days & then again after 3 months since I stashed it away and forgot about it & is bright & enjoyable still. This is so ridiculously up my alley, so YMMV. Really great use of jelly candy, rhubarb, and FA Raspberry. Sweet, fluffy, and sticky, but the rhubarb keeps it from getting cloying. I personally don't get a lot of strawberry, but it does a good job adding sweetness and backing up the raspberry. If you like INW Rhubarb, mix this.